Pride and passion: Pina Menichelli in Il padrone delle ferriere (1919) | Silents, Please! Aristocracy, hubris, and hauteur: these are the main ingredients in Itala-Film’s Il padrone delle ferriere | The Master of the Ironworks (1919), starring the majestic Pina Menichelli. I’d intended to cover another 1917 film in this Diva December entry, but when the Museo Nazionale del Cinema Torino uploaded this film a couple of months ago—for me, a longed-for title—my path was clear. In this tale, the course of true love is never smooth; but the ride is pure, unadulterated melodrama, and therefore a lot of fun. There are four main players in Il padrone delle ferriere: foremost is the divine Pina Menichelli, playing Clara di Beaulieu, a “young and haughty schoolgirl” who acts with all the assurance and entitlement of her aristocratic birth. 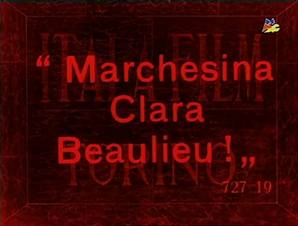 The introductory shot of Menichelli as Clara. A more upstanding personnage is found in Filippo Derblay, played by the always capable Amleto Novelli. Even though he is from the lower classes, Derblay is—believe it or not—a worthy person. This is demonstrated clearly when, at the start of the film, we see Derblay risk himself to save another, lowering himself into a mine by a rope to rescue a man who has fallen. It’s an act that attracts the attention of Ottavio, Clara’s brother, who admires Derblay’s “great nobility of mind”. But not nobility of birth. Rounding out the main quartet of characters is Atenaide Moulinet, a young woman guilty of the worst of all crimes: to be nouveau riche. Her father is an industrialist known as the ‘King of Cacao’; consequently, her classmates shun ‘Signorina Cacao’ socially. Millefleurs as Atenaide Moulinet, among her schoolyard ‘friends’. Though she doesn’t have a large part, one should also note the presence of Maria Caserini, grande dame of Italian silent cinema, as Clara’s mother, the Marquise di Beaulieu. The plot is rather thin, even by the standards of diva melodrama. Clara is living happily in her rarefied world of snobbery, when due to plot necessity the imprudent fiscal management of Clara’s father, financial tragedy strikes the immensely proud Beaulieu family. When the Duke learns of Clara’s family’s ruination, he instead takes up with Atenaide, who is attempting to make her way among the social elite. When Gastone’s association with Atenaide becomes clear, this rejection by her cousin-fiancé enrages Clara so much that, in a fit of pique, she decides to marry Derblay, the titular master of the ironworks. Clara scorns Derblay for his proletarian origins; he hides his love for her beneath a veneer of indifference. Can these two wacky kids overcome their differences, transcend social class, and find true love? Will the plot be motivated by an above-average amount of contrived lack of communication? And will Pina smoulder with emotion while wearing a series of gorgeous gowns? Thrice affirmative, dear readers. Of course, plot is not at the forefront of a film like this. Based on the wildly popular novel Le Maître de forges (1882) by Georges Ohnet, Il padrone delle ferriere provides a familiar framework through which to appreciate the talents of Pina Menichelli, who swaggers her way through the film with melodramatic flourish and not a little eroticism. She pouts; she seethes; she rages with the passions that continually stir her. There are volcanoes waiting inside her, which sometimes erupt in the most frenzied and unexpected ways. I’ve written before about how Menichelli always insists on her physical presence on screen, on the power of gesture and her gaze, on her emphatic movement through space. Obviously, I’m a big fan of the stylised and almost feral histrionics she uses to realise her characters, but beyond that, I simply find her fascinating for the way in which she makes her body and gesture visible to an extent that few performers do. Her emotions are projected through her body in a way that is charismatic, purposeful, and unusual. It’s a style quite far removed from modern-day mainstream taste, but Menichelli has a unique and compelling combination of charisma, commitment, and confidence. The kicker to this scene? It turns out that she is suffering from meningitis. I also liked the disdainful, semi-candid vibe of this shot, where Clara waves Derblay onto the tennis court. 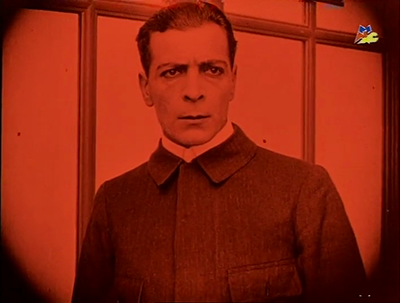 Director Eugenio Perego was a quite prolific filmmaker of the silent era, directing well-known actresses such as Soava Gallone (La chiamavano Cosetta, Film d’Arte Italiana 1917) and Musidora (La vagabonda, Film d’Arte Italiana 1918); perhaps most notable, however, are the string of comedies he made with Leda Gys in the 1920s, often considered high points within that dark decade of Italian cinema. 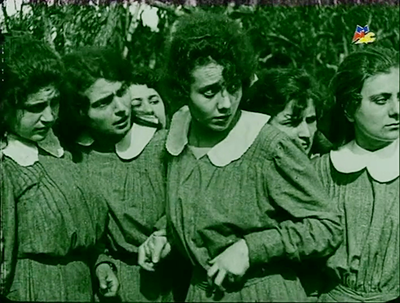 He collaborated several times with Menichelli, including on the extant La storia di una donna | The Story of a Woman (Rinascimento-Film, 1920). Perego understood Menichelli’s talents well, and built Il padrone delle ferriere around them. However, Il padrone delle ferriere has more to offer the audience than just menichellismo (though what menichellismo it is!) Part of what makes it an interesting film to me is the fact that it is carefully made and crafted, yet also completely committed to melodramatic excess. So on the one hand, you have a film which is beautifully photographed: notably and unusually, Antonio Cufaro’s camera captures actuality-esque scenes of the ironworks and factory. The camera also pays attention to extras and supporting players beyond the usual cursory approach, adding a nice flavour to the film. 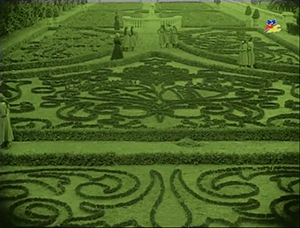 Shot composition is of high quality throughout; Cufaro is fond of iris shots and frequently uses them as a dramatic intensifier, or to call attention to a detail of the scene. I also really liked the sequence of shots showing the Clara and Derblay in the church: simple, but very strikingly composed. On the other hand, the film goes all-in on the melodramatic tropes. For example: Pina doesn’t have just one dramatic collapse, she has three. Where other diva films use flowers as mise-en-scène and the focal point of a scene or two, this film is festooned with them. Flowers as a proxy for emotion. And the theme of class difference and prejudice is not just a plot point, it’s hammered home at every possible moment. Il padrone delle ferriere is not long on subtlety: Perego surely knew what the aim of the game was, and he seems to have had fun with it. Consider the wedding scene: preceded by an ironic intertitle, “Matrimonio d’amore?”, the whole ceremony is dispensed with in one shot. 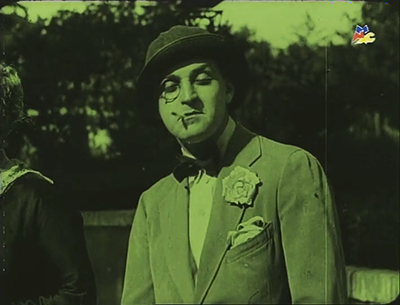 The camera is kept entirely focused on Menichelli, with Derblay not visible at all, except for his hand entering stage right to place the ring on Clara’s finger. Obviously, all is not well in their marriage: Clara looks like she’s going to the firing squad as she and her new husband drive off in a carriage. “I love my husband!” she insists at the reception, looking like she wants to die. On their wedding night, there’s a confrontation where she begs Filippo to leave her alone: “Take everything, my dowry, my gems, but my person, no!”, she cries. (Derblay and everyone else has kept her in the dark about the family finance fuss, for … reasons). Derblay eventually vows that their relationship will be for appearances only. Drama! A great reaction shot: Derblay tells his wife that he found the Duchess of Bligny charming. Eventually, the truth about her family’s ruination comes out, which helps Clara see Derblay in a whole new light. And in true diva fashion, she will finally start to look at him with appreciation when he presents her with that essential piece of jewellery, an incredibly long necklace. Atenaide is played by Lina Millefleurs, who was a quite popular actress of the late teens: I’m glad to finally have the chance to see her on film. She’s also a devotee of the Menichelli school of flower-nibbling. Millefleurs does a creditable job here, but the treatment of her character really undercuts the film’s ostensible point about snobbery, judgment, and social class. Atenaide’s introduction positions her as an underdog character who has done nothing to deserve the opprobrium of her classmates—apart from, of course, being afflicted with the terrible stench of new money. The rest of the narrative, however, reveals her as nothing but an arriviste who acts with self-interested calculation. Maybe this was meant as a counterpoint to Filippo’s narrative arc, or a warning about the corrupting influence of power/money, but it comes off as inconsistent and even sexist. Personally, I can’t really blame Atenaide for being ice-cold towards Clara, considering Clara’s earlier treatment of her. There’s a wonderfully passive-aggressive conversation between the two women where Atenaide reveals her betrothal to the Duke; I only wish Millefleurs had played it less straight. 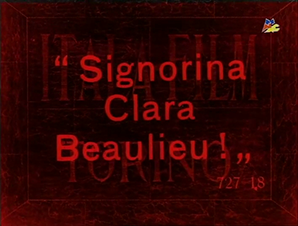 Itala Film backed Il padrone delle ferriere with a hefty publicity campaign, and the film was a box-office success. 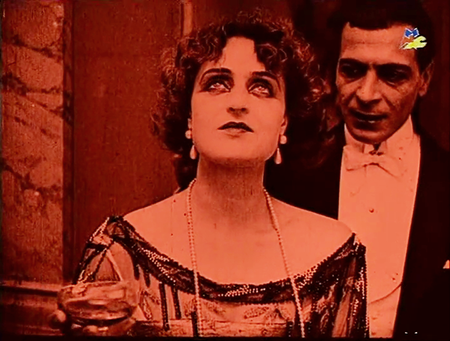 Critical reaction was more mixed, however: some reviewers rhapsodised about Menichelli’s performance—”the ardent passion with which she makes the blood rush, with ardent intensity and vigour, is a truly magnificent spectacle”—while others criticised the lack of character depth and the film’s didactic dramatism. Indeed the film is flawed, but I found it really rather enjoyable. And then as now, we can appreciate Il padrone delle ferriere as a delectable example of Menichelli at the height of her powers. Il padrone delle ferriere [The Master of the Ironworks]. Dir. Eugenio Perego. Torino, Italy: Itala, 1919. 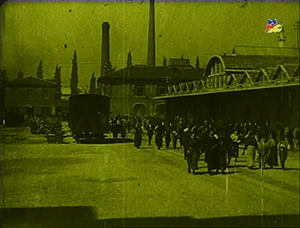 Restored in 2005 by the Museo Nazionale del Cinema Torino, in collaboration with Cineteca di Bologna. Available to watch online here, courtesy of the MNC. This entry was posted in Film and tagged Amleto Novelli, cinema of 1919, cinema of Italy, diva films, Lina Millefleurs, Museo Nazionale del Cinema, Pina Menichelli. Bookmark the permalink. Thank you very much! Menichelli was great, and I thought her acting was surprisingly convincing. I was delighted that she wasn’t killed at the end.